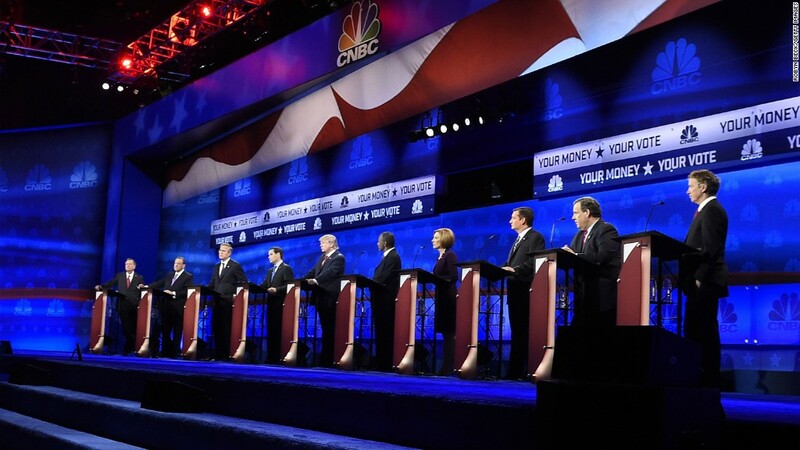 CNBC's Republican primary debate averaged 14 million viewers on Wednesday night, setting a new record for the business news channel but falling far short of the totals for two earlier debates this year. The Nielsen ratings reaffirm that the GOP debate slate is one of the most popular shows of the fall. The first debate of the season, televised by Fox News in August, averaged 24 million viewers. The second, televised by CNN in September, averaged 23 million viewers. By that standard, CNBC's 14 million viewer total might seem disappointing. But CNBC's prior viewership high was 3.9 million viewers -- set in 2002 during Winter Olympics coverage. In past elections, GOP primary debates have averaged 3 million to 5 million viewers at this point in the cycle. Donald Trump is a big reason why TV networks have seen big spikes in debate viewership this fall. The undercard debate at 6 p.m. was much lower-rated, with about 1.6 million viewers on average. Day in and day out, CNBC has a smaller audience than Fox and CNN, which made it hard for the network to match the earlier GOP events. CNBC's debate was also up against very stiff television competition: Game two of the World Series. The performance of the debate moderators was widely pilloried, by both the candidates and commenters on social media. The criticism spurred speculation that viewers might drop out before the end of the event at 10:15 p.m. ET. However, the preliminary data suggests that the audience peaked toward the end of the 9 p.m. hour. Perhaps the online complaints caused some viewers to tune in out of curiosity. Or perhaps glum Mets fans just wanted to take a break from the game. CNBC charged $250,000 for 30-second ads during the debate, according to an NBCUniversal source. Trump even brought up the sky-high ad rates on stage. The next GOP debate will be televised by the Fox Business Network, a rival of CNBC's, on November 10.